The Pillow platform takes Airbnb a step further, allowing both tenants and property management the ability to benefit from short-term rentals. With these types of rentals on the rise, Pillow has managed over 25,000 reservations. The digital age is simplifying many formerly cumbersome real estate tasks, but until recently, prospecting remained its usual tedious, often unscientific chore. One of the many blessings of the digital age: the end of paperwork. The TenantCloud rental and accounting management platform digitizes paperwork obligations, making it accessible in one location. For decades, real estate professionals treated acquisitions and disposition decision-making as an art form. Armed with outdated data, these professionals made their best guess on prospects before spending months securing funding. Real estate investing is a science, not an art. The power of cloud-based technology took a step forward today as FUEL Valuation, the next generation asset valuation and forecasting platform, announced on-demand connectivity with VTS, the leading leasing and asset management platform for the commercial real estate industry. The way commercial real estate professionals conduct business changed drastically over the last decade. Just ten years ago contract offers still routed through slow mail systems! Thanks to mobile apps, CRE pros accomplish more tasks and from anywhere. No need waste time driving to the office to check in. These are our favorite time-saving apps for busy CRE professionals. Venture capitalists continue recognizing the capital potential in real estate tech startups as proven by the $1.7 billion in investments over the last year. These startups are revolutionizing how brokers, agents, lenders, and more field professionals manage their businesses. The commercial real estate tech industry has launched incredible innovations that changed how CRE professionals conduct their everyday business. All year we’ve explored how technology is saving money, streamlining efficiency, and improving the client experience. Just in time for your new 2017 calendar planners: the top commercial real estate events for industry professionals. 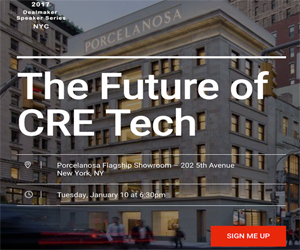 Expect the CRE Tech revolution to continue with this year's trade shows and conferences highlighting the technology changing how CRE professionals conduct business. Forget self-checkout--how about automated checkout with no lines, no fiddling with a scanner, and no hassle. Amazon announced it’s piloting a box store where shoppers walk in, grab what they want, and walk out. The first Amazon Go store, currently for Amazon employees, could flip the shopping industry on its head. Global funding in real estate tech over the past few years has exploded. In fact, real estate tech investments hit record-high levels in 2015, with US$1.7B raised across 191 deals. As we wrap up 2016, our team at Disrupt Property has published a list of the Top 20 Real Estate Tech Investments in 2016, summing up the year by pulling together a collection of companies ranging from ‘just got funded’ to ‘unicorns’, stretching from San Francisco to Melbourne, London to Singapore. As technology becomes increasingly prevalent in the commercial real estate industry, real estate professionals who fail to embrace those advances run the risk of becoming obsolete and falling behind the competition. Technology is changing the commercial real estate space at an unprecedented rate. Technology is also poised to add value to the industry in three critical areas moving forward. Increasingly rapid urbanization combined with demographic changes are poised to result in substantial growth within the commercial real estate industry over the next several years. Intense competition is also likely to drive real estate professionals to venture into emerging markets and new territories. Increasingly evolved technological tools provide investors and developers with the insight they need to manage a greater array of risks. Thanks to the availability of an increasing amount of data in real time, real estate professionals now have the ability to pinpoint the places to compete and how to compete the most efficiently. This will prove to be even more important as competition for prime real estate assets intensifies. For most building managers and building owners, achieving energy efficiency is now considered a high priority. Unfortunately, the task of achieving energy efficiency is also often viewed as daunting given the many elements involved in doing so. Advanced technological solutions have now made it possible for building owners and managers to get started with low-cost options that provide quick returns. Such options can often provide the motivation necessary for property owners to undertake energy-efficient measures that are more complex while offering a higher return. In terms of adding value to commercial real estate assets, energy optimization is considered one of the most significant benefits that technology provides to the commercial real estate industry. More efficiently operated buildings tend to deliver higher returns. Building owners who opt to invest in technologies that drive improvements in energy efficiency are offered the potential to increase the value and marketability of their commercial real estate assets significantly. Among the most important value-added opportunities offered by technological developments today are persistent building optimization, continual energy commissioning, and real-time utility benchmarking. The ability to respond to the needs of clients and emerging opportunities quickly has always been important in the commercial real estate industry. Due to the mobile revolution, the ability to respond quickly has become even more important. With an onslaught of new tech tools available, commercial real estate professionals are able to access vital information anytime they need it and from any location. As real estate tech tools continue developing, real estate professionals will be able to operate with even more efficiency and compete to an even greater degree. As commercial real estate tech continues to grow and evolve, the value added to the commercial real estate space will continue to grow as well. Never miss a new post. Sign up to receive email alerts! Real Estate Tech News © 2012-2015. All Rights Reserved.